MOSCOW, April 11. /TASS/. 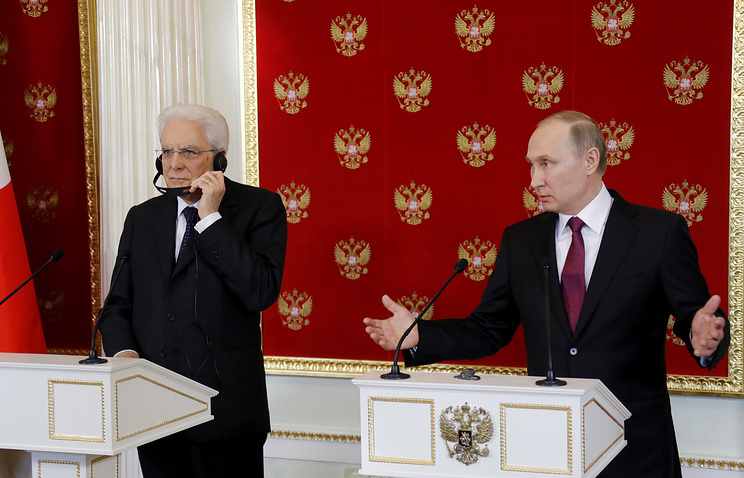 Russia has data that new provocations are planned in Syria with the goal of putting the blame on Damascus for allegedly using chemical weapons, Russian President Vladimir Putin told reporters after talks with his Italian counterpart Sergio Mattarella on Tuesday. "We have information from different sources that these provocations - I cannot call them otherwise - are being prepared in other regions of Syria, including in the southern suburbs of Damascus where there are plans to throw some substance and accuse the official Syrian authorities," Putin said. The Russian president has called to carry out a thorough investigation into the alleged use of chemical weapons in Syria’s Idlib on April 4. "We believe that any incident of this kind should be officially investigated," Putin said. 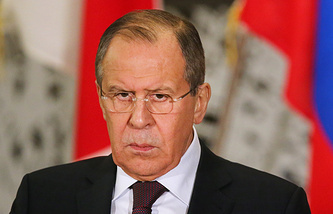 "We plan to turn to the United Nations bodies in The Hague and call on the global community to thoroughly investigate into this incident and make balanced decisions based on the investigation’s outcome," the Russian leader added. The US missile strikes on Syria remind of its attack on Iraq in 2003 when the United States launched a military campaign under the unproven pretext of Baghdad’s alleged possession of chemical weapons, Putin said. The United States’ military campaign against Iraq in 2003 led to the emergence of the Islamic State terrorist organization on the international scene, Putin stressed. "This [the US strike on Syria] strongly reminds of the 2003 events when US representatives in the UN Security Council showed allegedly chemical weapons found in Iraq," the Russian president said. "After that, a military campaign started in Iraq and it ended with the destruction of the country, the growth of the terrorist threat and the emergence of the ISIL [the former name of the Islamic State terrorist organization outlawed in Russia] on the international scene, no more and no less," Putin said. "The same is happening now," the Russian president said. Putin believes that by supporting the US missile strikes on Syria, the European countries seek to establish relations with Donald Trump’s administration. "Everyone wants to restore relations with the Western community after, thanks to the former US administration, many European countries took an anti-Trump stance during the US election campaign," he said. "There is a very good for consolidation - Syria, Russia, there is a common enemy," he said. "Nice! We are ready to tolerate this. But we hope that this will result in some positive trend of cooperation," Putin said. The Russian president also said Trump’s decision to launch missile strikes on Syria could be used by his political opponents. "If something happens, they will put the whole blame on him," Putin said. "I have no doubt about this." On April 7, US President Donald Trump ordered strikes on Syria’s Shayrat military air base located in the Homs Governorate. The attack, involving 59 Tomahawk cruise missiles, came as a response to the alleged use of chemical weapons in the Idlib Governorate on April 4. The US authorities believe that the airstrike on Idlib was launched from the Shayrat air base. The Syrian military denied its involvement in the attack. Russia’s Defense Ministry said that on April 4, the Syrian Air Force delivered an airstrike on the eastern outskirts of the town of Khan Shaykhun to destroy militant facilities used to produce chemical bombs. These bombs were sent to Iraq and were previously used in Aleppo. Russia has condemned the US missile strike. Kremlin Spokesman Dmitry Peskov said that Moscow considered the attack as an act of aggression against a sovereign state.